Docents | The Fralin Museum of Art, U.Va. Applications are now open for the Fall 2019 Docent Training Course. You can apply here. Students who wish to become volunteer docents can find more information but contacting the Docent Coordinator at 434-243-2050 or by email with questions. After their initial training period, student docents attend weekly education meetings that include workshops and lectures by education staff, curators, and guest speakers on special exhibitions and the permanent collection. As a group, docents take annual field trips to other museums. Volunteer docents at The Fralin Museum of Art lead engaging and interactive tours for school groups and community organizations from across the central Virginia region. They also assist with the Museum's special programs, including the annual Writer's Eye competition, and the Eyes on Art program for individuals with Alzheimer's. The Museum accepts applications on a rolling basis from community members who wish to become docents, and interviews are conducted prior to the beginning of each Docent Training Course. 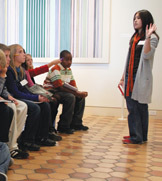 For information about future docent training opportunities, contact the Docent Coordinator at 434-243-2050 or email. After their initial training period, docents receive ongoing education from education staff, curators, and guest speakers on special exhibitions and the permanent collection. 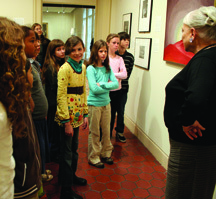 As a group, docents occasionally take field trips to other museums. Some docents also attend regional and national docent education conferences.